John Scott first stepped on stage as a stand up in May 1999 at the Stand comedy club. The promoters of the club were so impressed with his debut they asked him to participate in their Edinburgh Festival Fringe Show – Stand Up Scotland and two months later he found himself participating in the first of his six Edinburgh runs. It was shortly after his final fringe that John decided to move to England and pursue a full time career as a stand-up comic. Just prior to departing he managed to win the Scottish segment of The Spike Milligan Award for new talent. More recently John was chosen from over 200 applicants to participate in the BBC’s Jesting About project, a showcase for comedy writers and performers from the North East. The radio sketch show he was involved in is at this moment being considered for a BBC radio 4 slot. 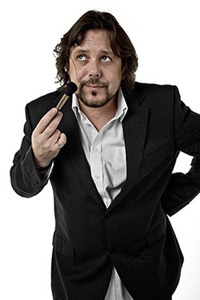 Outside awards and fringe runs as a comic John has hosted shows for such established names as Ross Noble, Michael Mcintyre, Reginald D Hunter and many more. He also works extensively on the corporate circuit and has appeared alongside such names as Jack Charlton, Peter Shilton, Nick Leeson (Rouge Trader) and again many more. His TV and Radio work includes Radio Scotland’s Fred Macaulay show, BBC Radio Newcastle (Various) The Hour, Edinburgh Nights, The Rovers Pub Quiz and Late Nite. As a writer he has contributed to Top 50 Greatest Scots, The Live Floorshow and has recently been asked to contribute to a new comedy show for BBC radio Newcastle.